Deutsche Bank has reported a surprise loss for the fourth quarter of 2013, after releasing its latest results before they were expected. Overall Deutsche said it posted a pre-tax loss of 1.153bn euros for the final quarter of 2013. The bank said that litigation costs and restructuring had weighed heavily on its financial performance. Litigation costs mounted up to 528m euros (£435.3m) for the period, while revenue fell 16%. At the end of last week the company's shares closed down 3% in New York after reports of a profit warning rattled already anxious investors. Deutsche Bank - Germany's largest lender - has faced some large problems in the past 12 months. In December 2013 it agreed to pay 1.4bn euros to settle a lawsuit with the US Federal Housing Finance Agency (FHFA). The lawsuit accused Deutsche Bank of breaking state and federal laws when it sold financial products backed by mortgage loans to Fannie Mae and Freddie Mac between 2005 and 2007. Also in December it was among six banks fined $2.3bn (£1.4bn) by the European Commission after been found guilty of colluding to rig two global interest rate benchmarks. 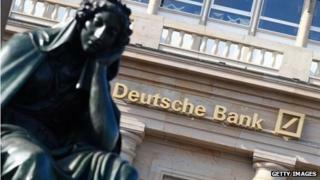 Deutsche Bank suffered the largest fine of the six - 725.36m euros - over rate fixing. For the year, it has set aside 2.5bn euros for various lawsuits. In Sunday's results statement, the bank's joint chief executives Juergen Fitschen and Anshu Jain said that they are confident of reaching their targets for 2015. Though they said that they "expect 2014 to be a year of further challenges". The bank will post a profit for 2013 overall, they added. Deutsche Bank had originally planned to release its results on 29 January.